I'm still getting settled in, so this isn't quite live yet. Anyway, I've had a couple of entries on the back burner that I've been working on, and they feel serious enough to warrant having their own place, instead of being a part of a corpus I started almost six years ago (in high school, no less). 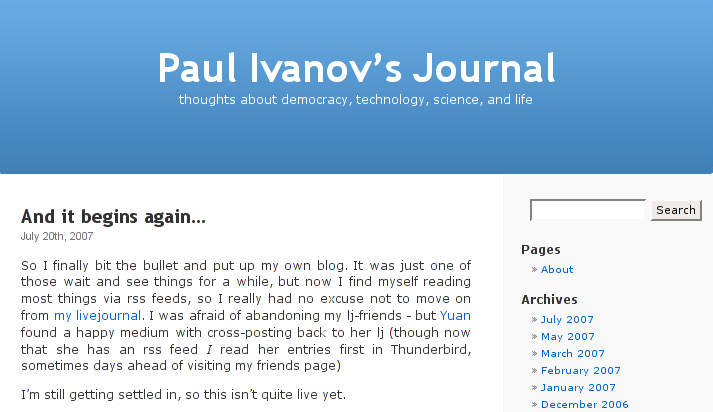 More and more people I know host their own blogs and it's always nice to have a fresh start (though I've reposted a hand full of my most recent LJ entries to get a running start).